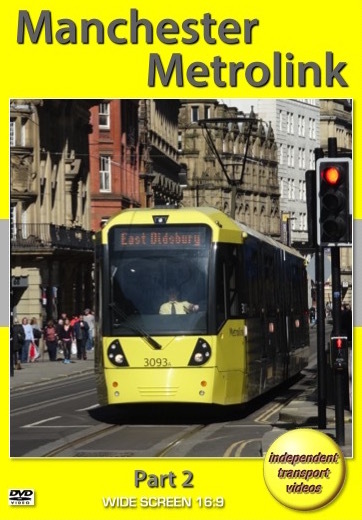 We would like to welcome you to this, our second DVD programme featuring the Manchester Metrolink light rail system. Manchester Metrolink opened in 1992 with a 19-mile route that ran from Bury to Altrincham via Manchester city centre using former railway lines inherited from British Rail. In view of this all stops were constructed to mainline railway platform height. Initially there was some 3km of street running from Victoria station to Piccadilly station, but this has now been extended as the system has developed. Major extensions to the network began in 2009 and by 2014 the trams also served Rochdale, Oldham, Ashton-under-Lyne, East Didsbury and Eccles. In late 2014 the trams reached Manchester Airport and in early 2015 the area of Victoria station used by the trams was completely remodelled. Work also began on the second city crossing (2CC) and this opened during March 2017. The fleet now consists of 120 Bombardier M5000 trams, which are 2-section bi-directional cars manufactured by Bombardier in their factories in Bautzen, Germany or in Vienna, Austria. All are in a yellow and silver livery, except for a small handful of cars which carry overall advertisements. On this programme we begin our filming in 2014 in Manchester city centre. Locations include Aytoun Street, Piccadilly Gardens, High Street and Shudehill. At the latter, evidence of the construction work can be seen as the trams emerge from Balloon Street. We then move to Oldham town centre where the trams had just started to run along Union Street. At Oldham Mumps stop we board trams 3039+3016 for the interesting journey to Rochdale Railway Station. Our tram travels at speed though open countryside with the backdrop of the Pennines, contrasting greatly from the busy Manchester city centre locations seen earlier in this programme. Alighting at the Rochdale Railway Station stop our cameras film the street running of the trams as we head towards the town centre. The next part of our programme is at the remodelled Victoria Station. Filmed in December 2016 we can see the trams operating through this major interchange where the trams meet with the main line trains. Our final location shows the second city crossing (2CC). Opened just a few days before our filming, we see the trams running along Corporation Street, through Exchange Square and then along Cross Street to the new St Peter’s Square interchange. Plenty of action for you to enjoy. Look out for further future releases from independent transport videos which will feature even more from this growing system.